Real Madrid are reportedly growing confident of securing the signing of Eden Hazard from Chelsea at the end of the ongoing campaign. The Belgian has been regularly linked with the European champions over the past year and the speculation over his future has intensified with his Blues contract expiring in 18 months. According to Marca, the Blues are unlikely to entertain any offers for Hazard this month, though a summer transfer away from the Bridge appears likely. It is added that Los Blancos have earmarked the Belgian as their prime summer target and Hazard could himself push through the exit door when the season concludes. 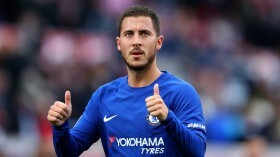 Hazard has already received a contract offer on the table from the Blues but so far, he has shown no indication that he would be willing to pen a fresh deal with the club. The Belgian attacker has been in fine form for the Blues during the current season and he has contributed 10 goals and 10 assists in the Premier League alone.